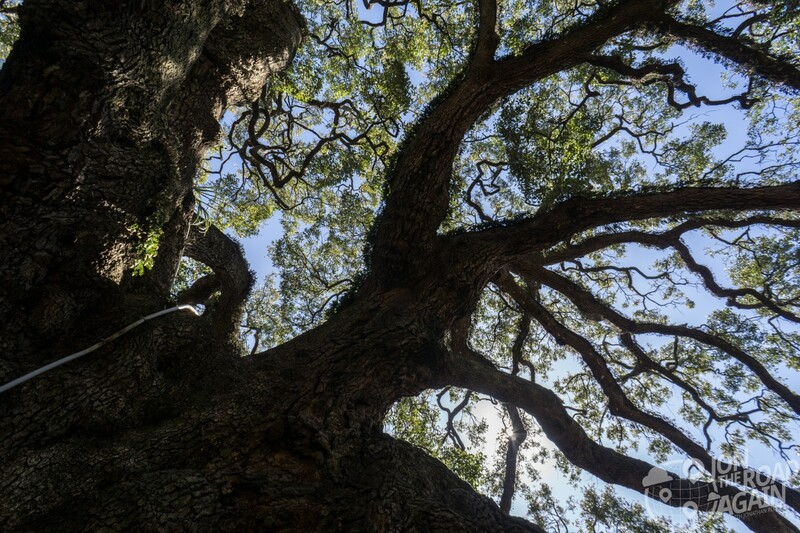 In downtown Jacksonville, a sprawling, 250-year-old Southern Live Oak was saved by a little white lie. That tree is called the “Treaty Oak” here in Jessie Ball duPont Park. 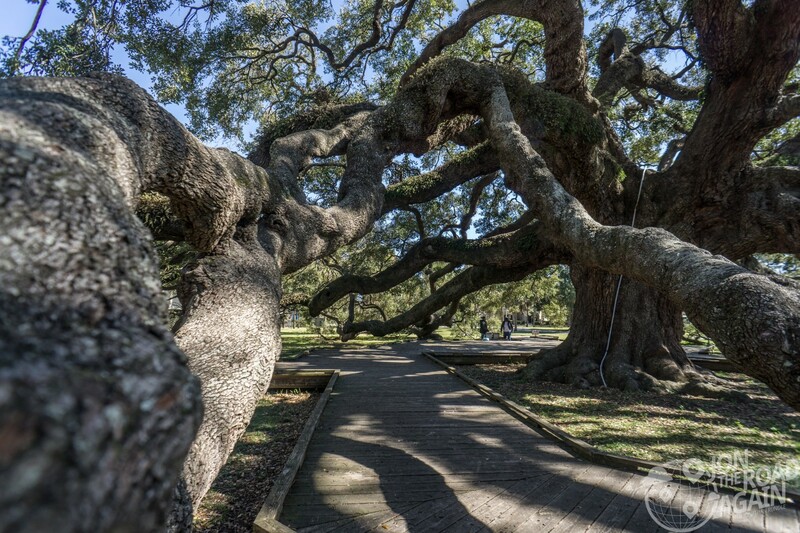 This beloved tree was first known by a more honest, less creative name: “Giant Oak.” Back in the early 1900s the tree served as a centerpiece to Dixieland Amusement Park. It witnessed a visit from Babe Ruth and a performance by John Philip Sousa. Okay that’s cool, but what about this lie you’re talking about? Read on! Dixieland is long gone, and plenty of modern development has popped up around the park and the Treaty Oak. Yet, this little patch of urban oasis persevered. It’s all thanks to preservation groups in Jacksonville that managed to protect the tree from developers. How? A little lie from Florida Times-Union columnist Pat Moran. 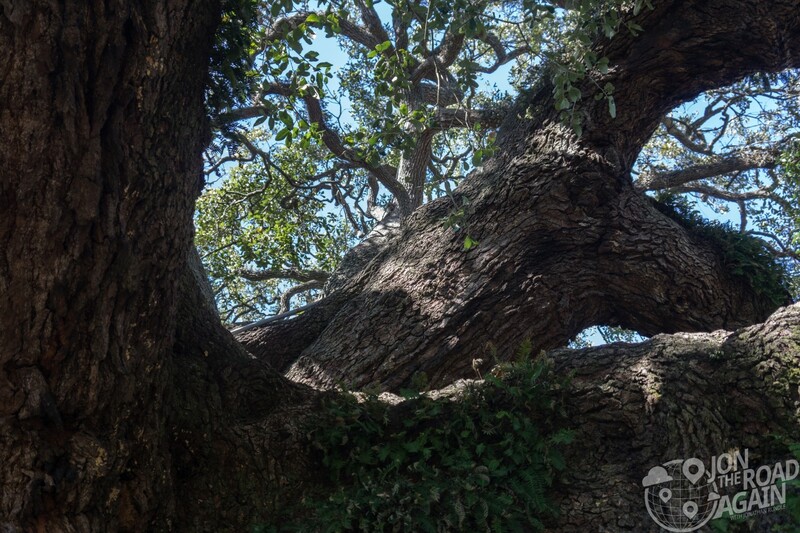 It’s beauty now bolstered by this newfound historic significance, Treaty Oak was given protection from future development by the city council. Years later, a founding member of the Jacksonville Garden Club, Ms. Jessie Ball duPont, bought the surrounding acreage and donated it to the city. 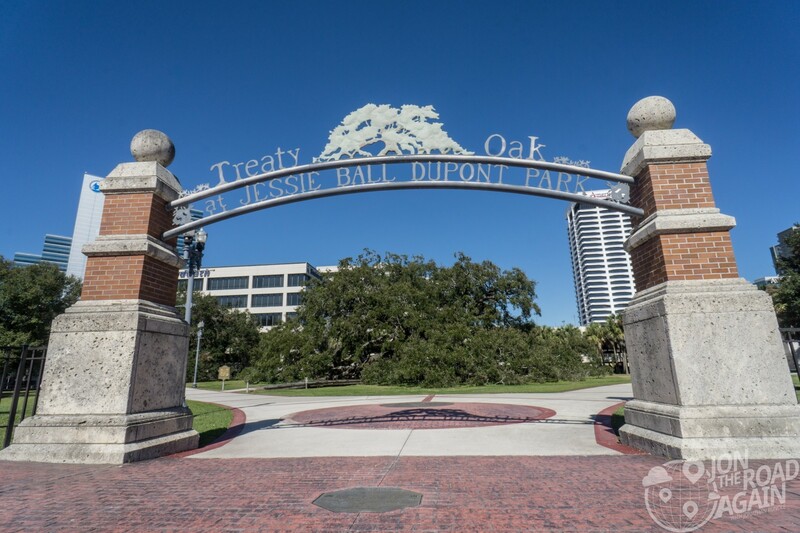 As a result, Treaty Oak Park expanded to 7 acres and was renamed in her honor. Walking into the canopy is more like entering a cave than sitting under a tree. The sprawling branches never seem to end. Jacksonville grows seedlings from Treaty Oak acorns and replants them throughout the city. Since the program started in 1986, hundreds of seedlings have been planted. 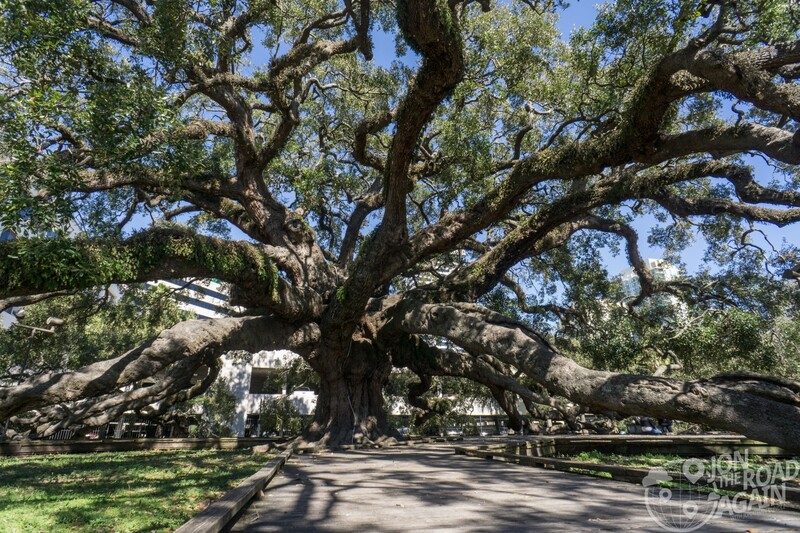 As the oldest landmark in Jacksonville, the tree continues to get a lot of attention. In 1995, cables were installed in the tree to support limbs that threatened to damage the trunk, and a lightning protection system was installed. 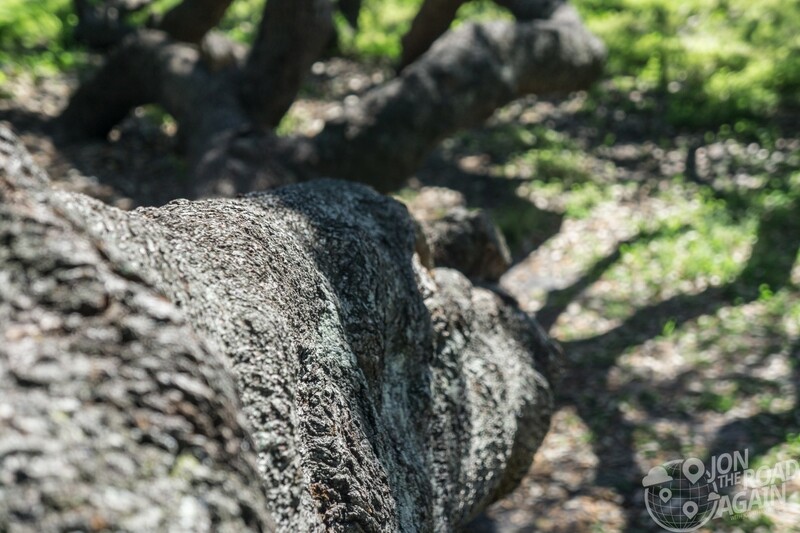 With continued care and attention, arborists estimate Treaty Oak could live another 400 years. It is an amazing site. I’m disappointed to learn that the Treaty Oak name was fabricated. As a child in Jacksonville I was always in awe of that story. I hope the tree does continue to live long after we are gone. It’s a beautiful part of Jacksonville. Journalists are a crafty bunch! At least the little lie saved this amazing tree. Thank you for reading and visiting!